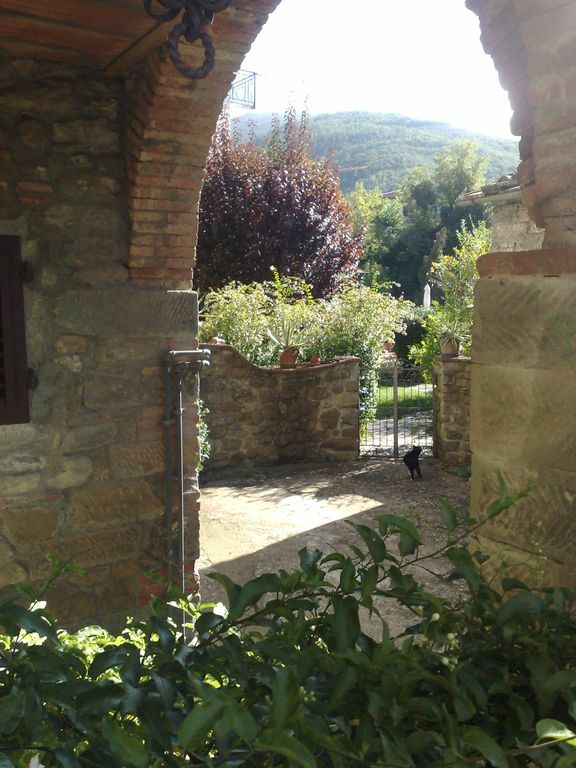 The apartment is located in the centre of the historical and medioeval village, Loro Ciuffenna. It is in a little square from where you can see (and hear ...) the church's bells. It is little but welcoming, simply furnished, with indipendent entrance and heating; outside a flight of stairs and a little balcony with deck chairs.Under the bedroom's windows there is a little “loggia”.The kitchen has a cooker, an owen, a kettle, a fridge with a freezer and various food processors.The bedroom is big, with liberty furniture; it has a double bed and two armchair bed, so the room accomodates four people. The bathroom has a shower, a bidet, a toilet ,a hair-dryer, a washing machine.The price includes the use of the apartment, the linen for the kitchen, the bedroom, the bathroom and the final cleaning. If people stay more than a week, linen will be changed and you can have a price discount. In the same building, with an indipendent entrance and heating, we can rent an apartment with two double bedrooms (rooms accomodate five people); ( See the advertise in Homelidays 300585) room accomodates 9 people.In the little square there is an iron eagle, a very famous sculpture of the village.The garden has two large terraces , in common with the owner. It can be used as a solarium, for lunch and dinner both in winter and summer. Inside there is a little tavern with a cooker, a fridge, wood- stove, and a fire-place. In front of the apartment lives a retired blacksmith called “dio Vulcano” who makes very creatively objects. This apartment is beautiful and the perfect location to travel around Tuscany. I visited Florence, Chianti, Cortona, Siena and Arezzo from this location. The town is very friendly and picturesque. Alda is simply wonderful and made me feel like family not just a guest. I was sad to leave and would love to go back again. Thanks for your kind words. Kindness is always repaid by kindness. I hope I'II have you here again soon. A perfect host and beautifull appartement! We had a beautifull stay in this absolute beautifull appartement. The owner was the perfect host who brought us frequently Nice Things to eat and drink. All was very clean and taken care of. Also we could make use of a big terras and outside kitchen. We want To thank Alda for her hospitality and we will certainly come back!! Per gli antichi Greci l'ospite era sacro, poiché dietro di lui poteva celarsi una divinità. Per me l'ospite è sacro in quanto persona e, come tale, merita rispetto, educazione e cortesia. Spero di avervi ancora qui. "We stayed at Aldas apartment for 2 weeks in September 2011. Loro Chiufenna is a really nice village with several bars and restaurants plus a good butchers and pasticeire. Brilliant base for touring Tuscany/the Chianti area. Alda is fantastic - doesnt speak much English but communication still isnt a problem.The welcome pack of food/drink is the best we had in 4 months of staying in different areas of Italy and we were made to feel very welcome. If we return to the same area we would go straight back to stay at Alda`s property"
"What can I say! A beautiful apartment furnished and decorated with style. Alda made us feel so much at home, even though language was a bit of a problem...but we managed!She is the perfect hostess with the best garden view in the world!" "This accommodation is outstanding! Bathroom and everything else is very clean! Beautiful furniture with a nice decoration. The kitchen is nicely equipped. There is a flower garden with a garden house and pleasant seating outside or inside the garden house. We have appreciated surprising attention to detail everywhere. Our host was very pleasant and helpful, we felt very welcomed. We would choose this accommodation again!! Very quiet location, good spot to explore Tuscany from. We are recommending this to all our friends." Alda war sehr gastfreundlich und man kann sie jederzeit um Rat fragen, sie wohnt im gleichen Gebäude. Ich Reise sehr viel und bin auch oft alleine unterwegs, aber gerade daher tut es sehr gut, so herzlich aufgenommen zu werden. Man kann von Loro Ciuffenna aus viele interessante Touren unternehmen. Habe viel von der Toscana kennenlernen dürfen während meines Aufenthaltes in Loro Ciuffenna, und vor allem ausserhalb der Touristenpfade, was mir sehr wichtig war. Danke Andrea. Es war mir ein sehr großes Vergrnügen Sie kennengelernt zu haben. Ich habe Ihre Freundlichkeit, Bildung und Höflichkeit sehr genossen. Ich hoffe Sie wieder in der kleinen mittelalterlichen Burg wiederzusehen: Sie sind immer ein willkommener Gast. Take the A1 Motorway Milan-Rome towards the South until Valdarno Exit (after Florence and Incisa). Turn on the right and follow the advertise for Loro Ciuffenna (8km). Following the road you'll find Terranuova Bracciolini , La Penna e at the end Loro Ciuffenna. At the first roundabout (in the centre there is a monument) , cross the Ponte Nuovo (New Bridge) and , at the crossroad, turn on the left towards the village. Go on along the ring road, then turn the second street on the right. You will face with an iron eagle and next to it there is your apartment ! Loro Ciuffenna is a medioeval village , one of the most beautiful in Italy. It is on a hill , at the foot of Pratomagno mountains . As soon as you arrive you'll be faced by the charming skyline of the village which stands , like a crib, with its tower and its old houses . Living there you'll discover the narrow streets, the water mill , the stones of the little Ciuffenna creek , the beautiful Pieve Romanica in Gropina, only three kilometres far from the village. In less than an hour you can reach Florence (45 km) , Siena (50km) , Arezzo (28 km) and Rapolano famous for its thermal baths. Unfortunately there is no railway station so you need a car or you can take the bus to reach the closest station in Montevarchi. In the country you can find every thing : the foodshop, the chemist, bakers, clothes shops, a little supermarket (there are some bigger in Montevarchi and Terranuova) and shops with typical local products. Very close to the apartment there is a shoemaker's , a very famous one because he repairs the shoes by hand. Non very far from Loro Ciuffenna there is the Prada's shopping centre and another shopping centre “Il Leccio” where you can buy , with good prices , the most important italian brands :Dolce e Gabbana, Loro Piana , Yves Saint Laurent, Gucci, Armani, just to mention some of them. On the 25th April there is the “Trout Holiday” : the fishermen compete to fish the biggest and the largest quantity of trout. The fish are sold and cooked in the main square of the village. It's a nice experience with the inhabitans of the village and of the surroundings. Consegna delle chiavi da parte del Proprietario presente in loco. Tariffe scontate in relazione alla durata.